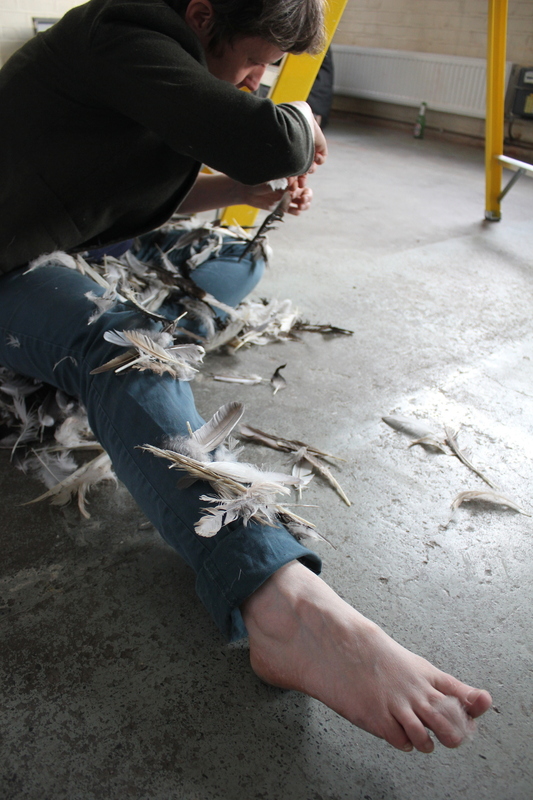 Ongoing performances with collected feathers and grannies feathers. Images below from Ruffling - Feathers found on London streets. 1 hour performance at Guest Projects, London, during AltMFA's International Jamboree. May 2015 and Unperforming, Inverness street Gallery 2015. Last weekend I began to follow feathers again in search of a route. Pluming I said. Did I tell you why I started collecting feathers?, they ask. There is water perching, round droplet tender, on the soft duvet filler ones. It hovers around thin white, the blow away curves which hang from the hollow nail bitten shafts. I close my eyes and catch a memory of an image read about, a droplet flash frame on a retina ready to be drawn. No they rethink, not blow away curves now, more fragile than curves. I think of David mentioning disease and not wanting one of the London feather filled parkas coats I’ve been making for our future expedition to the icebergs even if I wash the feathers before stuffing. Sometimes I get scared of disease too. I lift it higher and the feather extends along itself. Lilting, the feather extends along itself more, reaching out to gnawed shaft. Hold it. - along the feather into the line of a wing. A metre above the carpet, propelled by my mis judged pluck there is an attempt at a last flight. More of a flop. It’s gnawed-ness is gnawed chicken drumstick. Soggy I let it hold in my hand. A stroll up the gentle flank can be a delightful experience. Soggy I let go from my hand. The other feathers in my bag all taste dandelion. I spit on a round rock and leave it there for today.